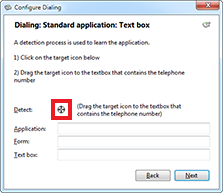 The dialing wizard is used to configure Go Integrator to dial from webpages that use text boxes and from within applications that the software doesn't already know how to dial from. In the Configuration screen, on the Dialing page, press the Add button to load the dialing wizard and then follow the appropriate set of instructions below. 1. Select the "Internet Explorer" option, then choose Text boxes. 1. Select the "Any other type of standard Windows application" option, then press Next. 2. 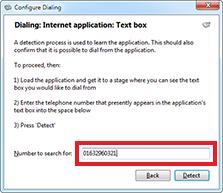 Locate a page in your application that contains telephone numbers in a text box. 2. Click and hold the mouse down on the crosshair next to the word "Detect" as in the screenshot above. 3. Enter the telephone number that is shown in your application into the wizard. 3. Drag the mouse (without releasing the button) over the text box in your application when a number is stored then release the mouse button when the mouse cursor is above the textbox. This is easiest if you have Go Integrator and your application side-by-side on-screen. 4. Press the Detect button. Go Integrator will then scan all open web pages and find the first instance of your number (you can only do one at a time). 4. If the crosshair icon changes to a check then it is likely that Go Integrator can add dialing support to this box. 5. Press the Next button and then press the Close button to save the settings. Then press Save in the main configuration page too. 6. Refresh the webpage and Go Integrator will add a Dial button next to the text box. A dial button will appear to the right hand side of the text box. This means that you have a ".Net application" (you probably saw a check when doing the detection also). If this is the case, then you should proceed to "Detect" the other text boxes in your application to make them work also. Alternatively, try hovering your mouse above the text box (making sure that there is a valid telephone number in it). All being well, a Dial and Hangup button will appear to the right hand side of the text box. This means that you do not have a ".Net application". If neither of these two things happen, then the text box probably isn't supported, so you should consider using the Clipboard method instead. Note: You might also be trying it with an web-based application, if so then have a look at the earlier section under dialing from a web page.